Book now for the best rates and availability. Adventurers, history buffs, and lovers of the Southwestern landscape will treasure the town of Page. Modest beginnings as a dam builders’ town paved the way for those seeking new landscapes, and it quickly became the Southwest’s “Frontier of Adventure,” residing in the heart some of the wildest and most undisturbed desert land in America. Situated atop Manson Mesa, Page is one of the youngest towns in the United States, established in 1957 with the building of Glen Canyon Dam. Its close proximity to many natural wonders now makes it the perfect spot for cyclists, hikers, campers, seekers of America’s colorful Wild West legacy, and anyone interested in the remarkable geological formations of its unique and dramatic landscape. Breathtaking beauty awaits you in the Glen Canyon National Recreation Area. 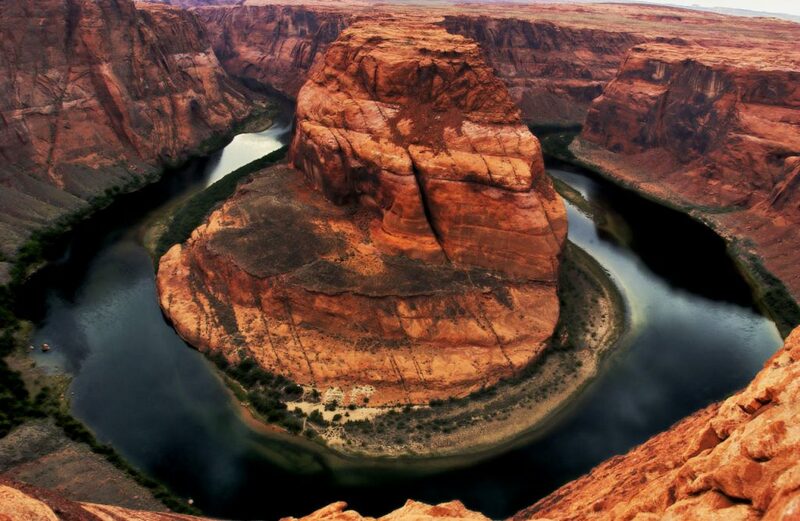 Just a short drive from downtown Page you will find Horseshoes Bend, a meandering loop of the Colorado River nestled among the red walls of the mesas. A 1,000 foot drop from the overlook makes it one of the best views in the state of Arizona. Visit Antelope Canyon for its famous water-carved corridors, enhanced in the summer months by beams of sunlight falling along the smooth, wave-like wall formations. Are you searching for a more secluded adventure? Visit the Rainbow Bridge, accessible by hiking trail and boat only. This storied natural bridge formation is considered sacred by neighboring American Indian tribes. With the Grand Canyon just a few hours’ drive away, Page is the place for the outdoor enthusiast! With history and beauty at your fingertips, Page is the perfect place to bring your family. Take advantage of historical sites to observe the Old West as it once was. Check out the Powell Museum, named for the Colorado River explorer and pioneer of the mid 19th century who helped open the Southwest to industry and expansion. The Hovenweep National Monument is home to several Pueblo-era villages–see firsthand the marvel and skill of an ancient people’s architecture. Learn about the miracle of Pipe Spring and the lives it sustained, from Native Americans and Missionaries to plant and animal life, at the Pipe Spring National Monument. Great shopping, dining, and entertainment await the leisurely traveler. Meet Navajo artisans and buy authentic Native American jewelry at the Pow Wow Trading Post, where Page borders the Navajo Nation. Fine dining and more casual atmospheres can be found in walking distance of your hotel: sushi, Native American dishes, American comfort food, and easy take-along picnicking fare are just around the corner! Find that last minute outdoor gear, including fishing and wake-boarding, at a variety of locations in the downtown area. Bookstores, cafes, and more await you. With so much to do and see, Page is sure to provide a memorable visit!